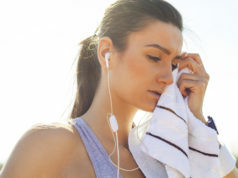 Don’t let your busy schedule keep you from getting your sweat on! This routine from Muscle & Fitness Hers technical adviser Gino Caccavale, the creator of the Rezist program, targets multiple muscles at the same time so you can blast more calories and get your workout done pronto. All you need is two sets of dumbbells (one light, one medium/heavy) and about 40 minutes. “Dumbbell training is the most effective way to do a variety of movements you just can’t get with a barbell or machine. Plus, it addresses any imbalances in muscles or joints,” Caccavale says. This routine will fire up all your muscles and get your heart rate up quickly so you can get on with the rest of your day. Directions: If you want to keep your heart rate elevated, do this workout as a circuit, completing one full set of each move, then repeat a second time. If you want to focus more on strength, do two sets of each exercise, resting for about a minute between each set. End your workout with a metabolic-boosting finisher set of high-intensity body-weight moves—or use it as a quick energy-boosting circuit for days when you have only a few minutes to spare. 2 sets, 20 reps per side. 2 sets, 25 reps per side. 20 reps – Perform as a plank shoulder tap. Do 20 reps per side.